The Patounis traditional soap factory dates back to 1850, when the first Patounis set up shop in Zakinthos under the brand “Bazakis-Patounis”. In 1891 Patounis opened a subsidiary factory in Corfu finally dissolving the partnership in the early 20 th century. The San-Rocco factory is the original establishment, but the family owned two other branches. One in Alexandras avenue and another near Corfu 's Hospital. One in Alexandras avenue and another near Corfu 's Hospital. 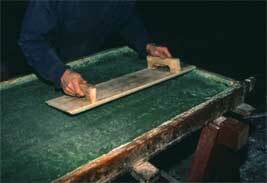 Soap manufacture was a tradition in Corfu already because of the large quantity of olive oil produced in the island. At the times before the factory the women used to make their own soap and Patounis in many ways has kept the already existed old tradition when started making soap. Apostolos Patounis, whose great-great grandfather founded the factory, believes that the factory is among the very rare ones that make soap the traditional way and the only one that he knows about is in Aleppo in Syria . 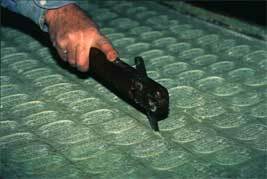 The soap starts as olive oil, which is produced with caustic soda in heated tubes for approximately one week. 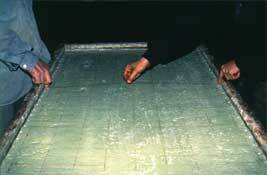 The resulting liquid soap is then cast in open moulds where it stays for a week or two to solidify. Finally the bars are placed on wooden racks to cure for 3-4 months. Basic and pure and natural ingredients are used for the Patounis soaps and no additives are used unless specifically stated. 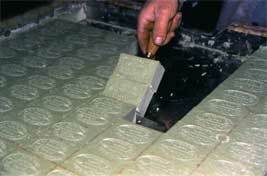 Patounis manufactures four main types of soap. 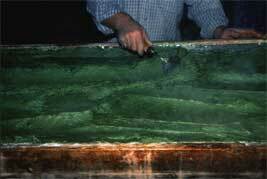 GREEN SOAP made of crude olive pumice oil known for its disinfectant and healing properties for skin infections, allergies, bed sores and strained muscles. 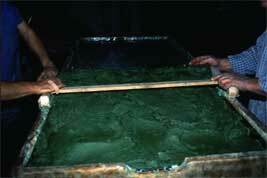 STRONG GREEN SOAP a more powerful formula effective for washing clothes and for use on hard ceramic surfaces. 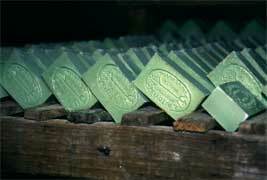 WHITE OLIVE/PALM KERNEL SOAP used as a gentle personal cleanser with good lathering performance. WHITE OLIVE OIL SOAP which is hypoallergenic and the very best for facial use. All the soaps are 100% vegetarian and 100% biodegradable. Economical to use and still recognized as one of the oldest beauty secrets that have come traditionally from the grandmothers to the granddaughters. There is an increasing market demand for this beautiful traditional soap and the 80% of export goes to Japan with Germany coming second. Patunis has tapped into a contemporary vein- the desire of a growing number of people for a more natural and purer lifestyle, to which Patounis soap can contribute.